Alan J. Wein, MD is professor and chair of the Division of Urology at the University of Pennsylvania School of Medicine and Chief of Urology at the Hospital of the University of Pennsylvania. He is a graduate of Princeton University and received his MD from the University of Pennsylvania School of Medicine. He completed residencies in surgery and urology at the Hospital of the University of Pennsylvania and a fellowship at the Harrison Department of Surgical Research in urology at the University of Pennsylvania School of Medicine. He has been certified and re-certified by the American Board of Urology Dr. Wein has been recognized nationally and internationally through his many affiliations and professional memberships which include the American Urological Association, the American Association of Genitourinary Surgeons, the Clinical Society of Genitourinary Surgeons, the Society of Pelvic Surgeons and the Société Internationale d’Urologie. He is the 1992 recipient of the Urodynamics Society Lifetime Achievement Award, the 1996 recipient of the F. Brantley Scott Award of the American Foundation for Urologic Diseases, the 1997 recipient of the Hugh Hampton Young Award of the American Urological Association, and the Distinguished Service Award of the American Urological Association in 2000. 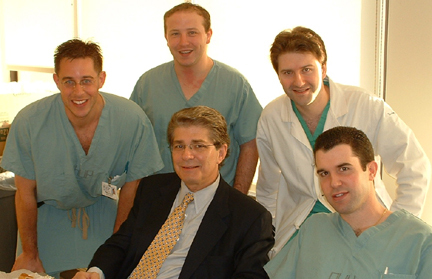 In 2001 he was presented the Distinguished Contribution Award by the American Urological Association. In 1996 Dr. Wein delivered the Ramon Guiteras Lecture at the annual meeting of the American Urological Association. He has served on numerous medical committees and advisory boards both domestically and internationally, and has received numerous awards and honors for excellence in the field of urology. He has held or does hold editorial positions on many well-respected journals including Journal of Urology, Urology, Neurourology and Urodynamics the British Journal of Urology International, and the Survey section of the Journal of Urology. Dr. Wein has published more than 700 articles, 14 books, and has more than 20 multimedia presentations to his credit. His extensive experience in the field of urology has afforded him the opportunity to participate in academic activities, meetings, and courses as a speaker, faculty member, and chairperson. He is a prodigious lecturer with over 500 invited academic activities over the course of his career, including the co-chairmanship of the World Health Organization 1st and 2nd International Consultations on Incontinence. His fields of interest lie in urologic oncology, voiding function and dysfunction, the physiology and pharmacology of voiding function and dysfunction. Dr. Wein is the new editor-in-chief of Campbell's Urology.Read "A conversation between Darracott Vaughan and Alan J. Wein."